Our Institute warmly welcomes our distinguished guest Prof. Dr. Rolf H. Möhring from the Fachgebiet Kombinatorische Optimierung und Graphenalgorithmen (COGA) of the Institut für Mathematik at the Technische Universität Berlin (TUB) in Berlin, Germany. Prof. Möhring will stay with us for a short research visit from June 5 to 8, 2018. During his stay, he gave the research talk on "Dynamic Network Routing: Meeting the Challenge of Complex Traffic and Transportation Tasks" and conducted joint research with our Dr. Zijun Wu. Prof. Dr. Rolf H. Möhring is a full professor at the Fachgebiet Kombinatorische Optimierung und Graphenalgorithmen (COGA) of the Arbeitsgruppe Diskrete und Algorithmische Mathematik, Institut für Mathematik, Fakultät II - Mathematik und Naturwissenschaften at the Technische Universität Berlin (TUB) in Berlin, Germany. He has received his Diplom (equivalent to MSc), Dr. rer. nat., and Habilitation in Mathematics at the RWTH Aachen in 1973, 1975, and 1982, respectively. He was assistant and associate professor at the University of Hildesheim and then at the University of Bonn, respectively, before joining the TUB in 1987 as full professor. 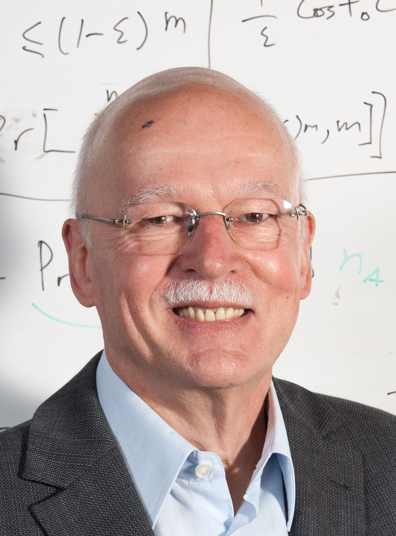 Since 2016, Prof. Möhring is Professor Emeritus at TUB and Member of the Board of Directors of the Beijing Institute for Scientific and Engineering Computing (BISEC) [北京科学与工程计算研究院] of the Beijing University of Technology (BJUT) [北京工业大学] in Beijing [北京], China. Prof. Möhring is an outstanding scholar in the fields of graph and network algorithms, combinatorial optimization, scheduling, operations research, and their industrial applications. His research works have been cited 2700 times in the past five years alone. He has received several international honors, such as the 1995 Harris German-Dartmouth Distinguished Visiting Professor of the Dartmouth College, Hanover, NH, USA, the Wissenschaftspreis der Gesellschaft für Operations Research (GOR, 2005), the Gold Medal of the Association of European Operational Research Societies (EURO, 2010), and the Honorary Professor title of the Beijing University of Technology (BJUT) in 2014. As member of the Editorial Board, he contributed to several prestigious journals such as Discrete Applied Mathematics, the Journal of Scheduling, Management Science, Mathematical Methods of Operations Research (MMOR), Operations Research, ORDER – A Journal on Ordered Sets and its Applications, and the SIAM Journal on Discrete Mathematics and he has been organizer of events such as the International Conference on Operations Research (OR'94) and the International Congress of Mathematicians (ICM'98), as well as of several workshops and Dagstuhl Seminars. Prof. Möhring has held several important positions in national and international societies, including President of the Gesellschaft für Mathematik, Ökonomie und Operations Research (GMÖOR, 1994–1996), Chair of the Executive Committee (1992–1995) and President (2004–2007) of the Mathematical Programming Society (now Mathematical Optimization Society, MOS), and member of the DFG Research Center Matheon "Mathematics for Key Technologies," where he was in charge of the Application Area "Logistics, Traffic, and Telecommunication Networks".